empty space I Frankfurt /M. Believing to know Frankfurt is a good precondition for regarding these photographic works, which under the title 'empty space' challenge the investigative acuteness of their visitors. 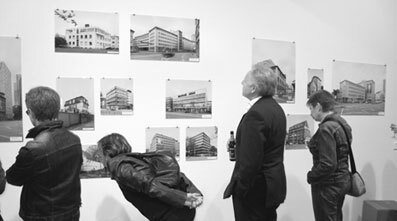 Having seen the building somewhere at some point, and searching for it in one's memory heightens the sensibility for the thirty-two photographs of the exhibition showing vacant buildings in Frankfurt. As simple as this concept may initially seem, the selected results are exceptional and diverse. Whether the photograph displays an industrial building, a house, or an office building, the viewer finds himself in the imago of his or her own cityscape, automatically trying to locate and categorize the reproduction. The clear photographic focus on the buildings allows for diverse interpretations. One of the primary ideas behind the realisation of the project is the documentary aspect of the photographs. Furthermore, the selection and form of the works reveal something that exceeds the sole interest of archiving: The desire to tell something about this city - not loudly and pretentiously as is often the case here, but rather a bit more slowly, calmly, somehow more enduring. And without a doubt, a bit more sadly as well, given the rapid changes in the cityscape taking place nearly every day, often demolishing a potential room with cranes and wrecking balls. Notably in Frankfurt's overpriced cosmos with a lack of space, vacant buildings could provide opportunities for creative appropriation by the citizens - room for temporary or readapted use within one's own urban life. With their works from 'empty space', Gregor Maria Schubert and Ralf Barthelmes show an urban reality far from the panorama postcards from souvenir shops at the Römerberg. Yet several of the selected buildings can be easily identified as part of Frankfurt. Who has not been in the rotating restaurant of the Henninger Tower as a child? Or who at least recognizes the building as an established part of the cityscape, shaping it, a towering solitary structure on the south side of the Main river? The flaneur, as Walter Benjamin once stated in the Arcades Project, strolls through the city without a clear destination, but rather with the intent to see it in a different light. To take it as it comes, instead of rushing by. To raise the awareness for something that would otherwise be easily overlooked, drowning in the chaos of the city, hidden and unnoticed. In this way, the viewer's own memory and routine become the starting point for a different spacial and chronological quality of Frankfurt, which, given its volatility, can currently be acknowledged as historical. empty space was curated by Annette Gloser.